What does it take to build up a new region for oil and gas development? Obviously, the resources have to be in place and economically recoverable. But it is not as easy as just sticking a drill into the ground and pumping out oil and gas. Even with significant oil and gas reserves trapped in shale, a variety of factors need to come together to turn a given region into a significant producer. To begin with, there needs to be enough companies willing to take risks on major drilling projects. Next, there needs to be enough capital behind those companies to make projects viable. And once explorers find and prove commercial quantities of oil and gas, there needs to be infrastructure in place to move the energy to market. That last piece – building the storage tanks, compressor stations, and pipelines that will transport product to refineries – is a sure sign that a region is starting to make a name for itself. Only when it becomes apparent that oil and gas will be recovered in significant volumes will companies put millions of dollars on the line for the infrastructure. Related: Canada’s Montney Natural Gas Basin – Game Changer? This combination of full exploration and development along with infrastructure build out is beginning to happen in the Montney Shale, a formation that stretches across western Alberta into northeast British Columbia. The area is expected to hold 450 trillion cubic feet of natural gas and 14.5 billion barrels of natural gas liquids and 1.12 billion barrels of oil. One particular area in the Montney that is beginning to attract significant attention is Elmworth, located just outside of Grande Prairie, Alberta. Companies are stepping up their capital expenditures in the area as it is showing signs of being very productive. 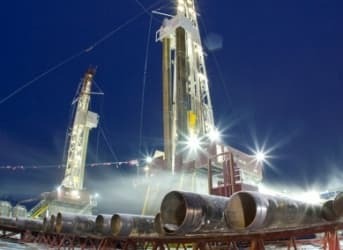 Encana (NYSE: ECA) is the biggest player in this region, and has drilled in excess of 47 wells, all targeting the Montney resource and each coming back with positive results. Encana drilled 7 wells in the second quarter of 2014, with initial production rates of about 12 to 14 million cubic feet per day (MMcf/d), and higher than expected liquids production. They have six rigs active in the Montney and had drilled 50 net wells by the middle of the year. In a sign of the company’s confidence in its future production, it constructed a compressor station capable of handling 100 MMcf/d at its Pipestone project, located in the Elmworth area. Encana estimates that there is 25 years’ worth of drilling on its acreage alone, with a potential of 2 billion cubic feet per day (bcf/d) and more than 50,000 barrels of oil per day (bpd). One smaller company, NuVista (TSE: NVA), is also posting exceptional results. In its latest corporate presentation stated that it will have 32 wells on production in the Montney by the end of 2014, double the number that it started with at the beginning of the year. The results that have been released to date show wells with initial production rates ranging from 916 to 1,770 boe/d – which are further showcasing the exceptional nature of the Montney in this particular area. The company is now averaging about 18,030 barrels of oil equivalent (boe/d) in production per day. And it is in the Elmworth area where more companies are turning their attention. NuVista just completed a major purchase of acreage in the Elmworth in August 2014, acquiring 12.5 more sections for $2.91 million per section (640 acres). As companies like NuVista and Encana drill the Elmworth, they are finding that it is rich in natural gas liquids and oil. For 2015, NuVista plans on building another compressor station at its Elmworth block. An even smaller company is making a move to graduate from its small cap positioning to that of a junior producer. Blackbird Energy (TSX Venture: BBI) also completed a major land acquisition, and the intriguing part about this acquisition was the close proximity of the acquired land to NuVista’s newly purchased acreage and the price it appeared to pay for the land (approximately $300,000 per section). Both companies appear to believe that the Elmworth is going to be a hot play, and are not waiting for bigger players to move in. Blackbird is drilling back to back wells in its Elmworth acreage, one targeting the Upper Montney which has been exploited by Encana and another targeting the Middle Montney, which Nuvista and other producers in the area have been targeting. Blackbird is also focused on establishing infrastructure to tie in its wells for production. At the end of September, the company signed a memorandum of understanding with Mistral Energy that could see the construction of gas gathering systems. If and when it is completed, the system will take 20 MMcf/d of natural gas from Blackbird’s fields, which could eventually be expanded to handle 35 MMcf/d. Mistral’s system will have a total capacity of 50 MMcf/d – with potential to expand to 70 MMcf/d – and will allow other companies to tie into the system. Then there will be an 8 inch pipeline that will run south to connect to yet more proposed processing infrastructure. All of the companies mentioned above are poised for value creation due to the promise of the Montney. But intermediate players like NuVista – and especially emerging producers like Blackbird – could see the biggest boost to their share price as they report impressive initial production rates from their wells. NuVista is predicting that its overall production for 2015 will climb to 23,500-25,000 boe/d, up from an expected average of 17,750-18,500 boe/d for 2014. The smaller Blackbird hopes to transform its prime land block at Elmworth into a productive acreage. It expects to complete its two wells by January 2015, which will be a huge moment for the company. Blackbird could see its share price jump to a new level if its two wells come back with positive results effectively proving up its acreage. What are we to make of all of this? It would be one thing if a few companies were just drilling some test wells or doing some geological assessments to figure out how much oil and gas sat beneath them. But, when a multitude of companies start pouring millions of dollars into gas gathering and processing infrastructure, you have to figure that they know they are sitting on a bounty. And it isn’t just one company. They are all doing it, and all at the same time. The Montney is getting hot.